Just beautiful weather here the last week. We have been living under a high pressure system that is forcing some wonderful meterological phenomena. 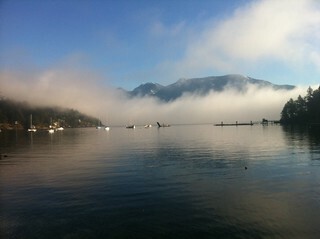 Notably, the high pressure traps cold air near the sea and creates an inversion, meaning that the moisture can’t escape and form clouds, so it lingers at sea level forming think banks of fog that fill the Strait of Greorgia and Parts of Howe Sound. Last night the fog bansk were as thick as they can get and all night long we were treated to the soothing symphony of dozens of different fog horns sounding out in the dark. the Point Atkinson lighthouse, which is miles away at the entrance to English Bay has a classic two tone deep “eeeee-ooooo” and the whistles and horns from moving ships in the night answered the call. This morning in the bright sunshine on Bowen, the fog did it’s best to fill the Sound, but we somehow escaped the cool, and we are being treated to an incredible display of light and blue sky and grey fog flowing in from the Strait. There is something to be said about how bright the sun is when it rises out of the fog and reflects off the tops of what previously obscured it. Yesterday, the kids and I went skiing at Cypress and the view from Mount Strachan shows the way the fog coats the city and eases part way into Howe Sound. It made for beautiful views, and a gorgeous sunset.